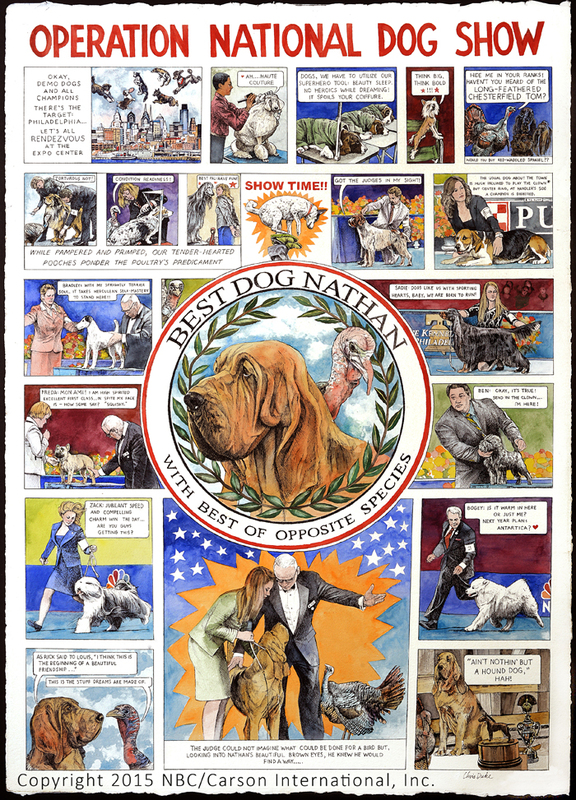 Inspired by my visit to the epic 2014 National Dog Show, I decided that I had to paint a graphic-novel style piece illustrating the show from a furry and feathered point of view. I had fun planning the art, all the while dreaming about the true nature of the breeds depicted. Dogs are so good, so well behaved at the shows, though we know the Affenpinscher, say, is truly a clown. Dogs have such unique character. The Schnauzer is notorious for his independent streak and the ancient and fiercely protective Chow Chow is renowned as unsuitable for beginner owners. The French Bulldog here obviously speaks with a cultured accent while the Gordon Setter is a beauty to behold... Is she cognizant of her grace? Our hero Nathan the Hound Dog has to be true blue. This art is owned by NBC and Carson International, Inc.